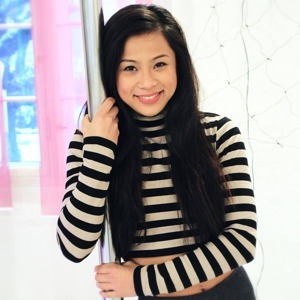 Ine started pole dancing in early 2012, and has been hooked since. She loves the combination of flexibility, strength and dance and also how rewarding it is to see and feel that you keep making progress. Her training background includes gymnastics, football and basketball. When Ine is not at the pole studio she is studying mathematics and physics. My name is Anna and I am representing Sweden. I am 18 years old, and studying last semester in high school. I have been dancing since I was three years of age. I took ballet, show dance and street dance lessons. I began to pole dance one year ago. It is my first competition and I am so excited about it! Yvonne is a grade school teacher by day, pole instructor by night. Yvonne has always had a passion for fitness and art. After graduating from University she traveled through South America. It was there that she fell in love with latin dance, primarily Salsa. Upon returning home in 2012, she found pole dance, which gave her a way to mend her love of fitness and art. Pole dance has become an addiction for her, causing her to spend countless hours honing her skill. Although she is new to the field, she is overwhelmingly excited to try her hand at competing. Linn has been dancing since she was 4 years old. Starting out with ballet and tap dancing, she later moved on to try many other forms of dance, including jazz ballet, street dance, hip-hop, cheerleading, and Bollywood. Three and a half years ago, Linn found pole fitness. Originally just a fun new dance form, she now loves the combination of strength, flexibility, acrobatics and dancing that it involves. In particular she enjoys the sense of achievement when she manages a new trick! This will be her first competition, and she is really looking forward to performing. 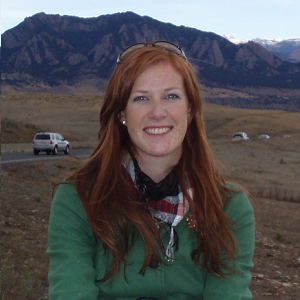 When Linn is not practicing pole fitness, she works as an environmental advisor in the oil and gas industry, enjoys skiing, travelling and being with friends. During the day Lærke studies biology at Copenhagen University. She has just finish her bachelor and has decide to focus on and enjoy pole dancing until starting her masters this summer. She has 2 ½ years of experience as a pole dancer. Lærke has no dancing experience or had other hobbies as physically demanding as pole dancing. She was attracted to pole because of the ability of making it look elegant or cool, through bruises, pain and the physical exhaustion. As a dancer she seeks to entertain the audience. She does this by trying to show her own style, with passion, sensation and emotion. As a child, Julia participated in rhythmic gymnastics. 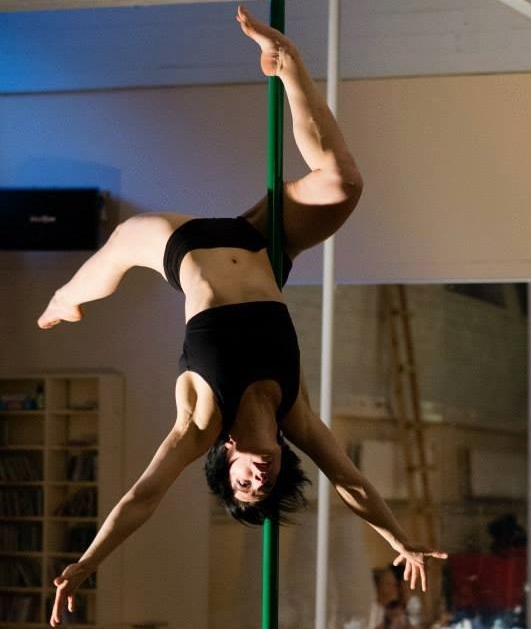 She started pole dance in 2010 – for her, a form of art where you can connect music and acrobatic tricks in the whole dance. She works in Togliatti in a dance studio ”EVA”. After one and a half year of training she began to participate in Russian championships. She was the runner-up at Miss Pole Dance Russia for three times. In 2012, Julia was in the final of World Pole Sports championship in London and Zurich. For Julia the most important is artistic side of pole dance than a sport. Miss Pole Dance Russia 2013- 3d place, Pole Cup International 2013- 3d place, battle of the pole 2013- 3d place, Miss Pole Dance Russia 2012- 3d place, Miss Pole Dance Russia 2011- 2nd place . Anna-Maija comes originally from Finland but has been living in Sweden for the past 6,5 years. With a background from competitive cheerleading she discovered pole dancing for less than two years ago. Since the very first class she has devoted most of her free time for training. During the past few months she has found a completely new passion for performing. She made her competition debut in Battle of the Pole 2013 winning the first place in amateur category and she was a runner up in Copenhagen Pole Competition 2013. Since these competitions Anna-Maija has traveled to various countries for training and has also broadened her training plan from pole to dance and contortion classes. Recently she won the Swedish Champion title. 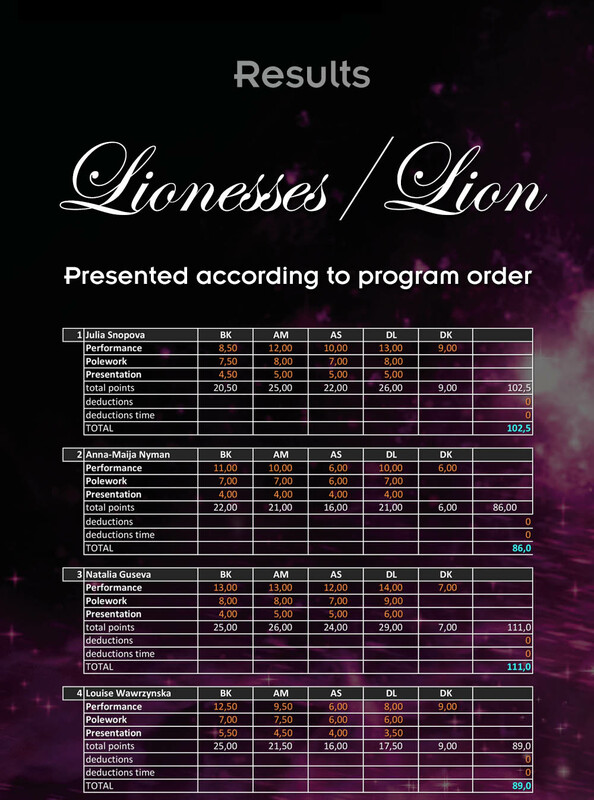 Anna-Maija is honored to get to compete in Lionesses category against a group of talented and experienced pole artists. Natalia has been doing sports since she was 5 years old. Her background is sport and rythmic gymnastics as well as acrobatics and dance. Natalia started pole dancing 4 years ago. Every time she perform she tries to do it better than she did it before. She is also a professional fitness instructor and choreographer. She likes combining sports and the art of dance. She loves moving forward and being different. She is also a mom and she is very happy that her son is proud of her. 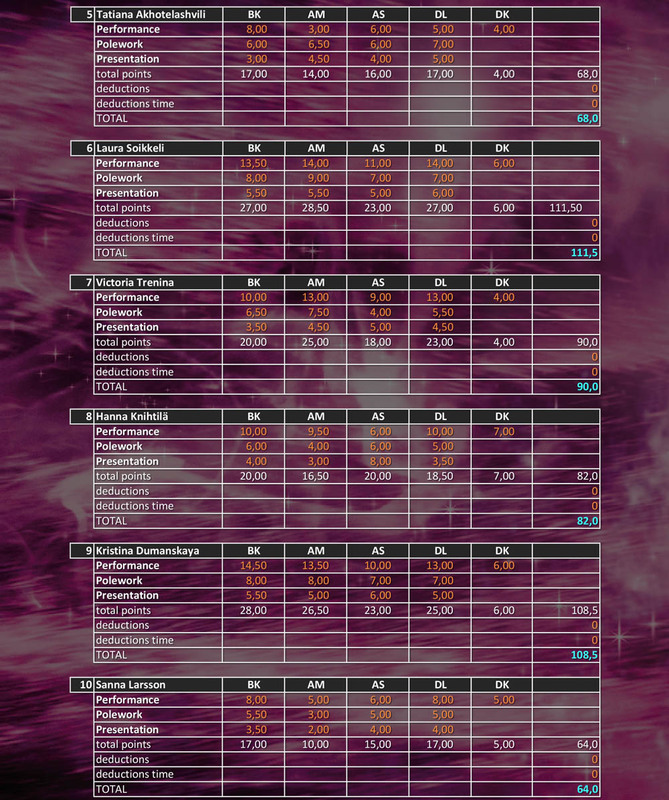 Previous competitions include: World Pole Sport Championship (IPSF) 2013 London-5 place. 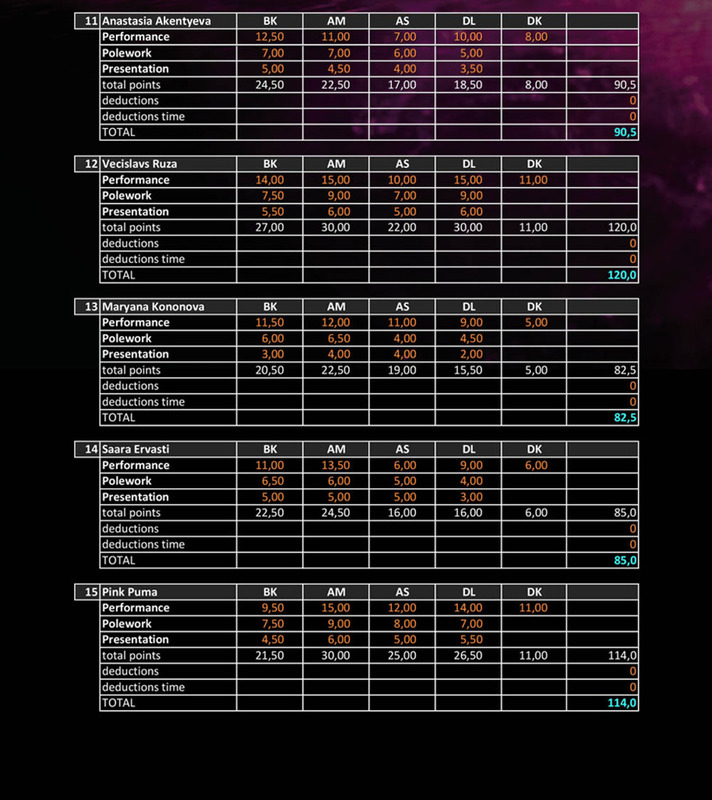 1st place at Miss Pole Dance Russia 2012 and 1st place at Miss Pole Dance Russia NW 2012. Louise started dancing and doing gymnastics in an early age, but never stuck with it for long. doubt her passion was found. 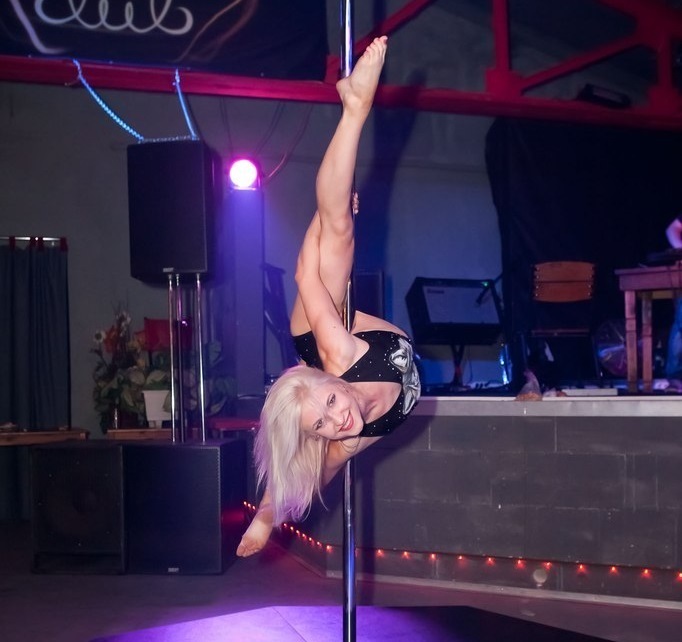 Louise have now been pole dancing for 3,5 years (self-taught), she loves to be on stage where she can share her passion for this beautiful art with others. 5th at the Pole Dance Cup 2013, Poland. 1st place at the Copenhagen Pole Competition 2013 (Female category), Denmark. Tatiana used to go to gymnastic classes when she was small and later she studied Belly-dancing and hip-hop, but nothing touched her the way pole-dance did, when she first saw it. Tatiana has a degree in philology and used to be a school teacher. It's been 8,5 years now that Tatiana dances professionally. She is the constant participant of all pole dance competitions in Moscow. She has her own pole dance school and she's happy to create true art. Laura started pole dancing at the end of march 2010 and fell in love right away. She has a background in synchronized skating and has been skating since she was 4 years old. She competed in top Finnish teams for 10 years and achieved 3 junior world championships. At the moment Laura is studying Finnish language at the University of Helsinki. She is also working as a pole instructor at Vertical Club and Fight Club Kouvola. Besides pole dancing Laura practices circus (especially aerial acrobatics), dancing, ice skating and yoga. Victoria has been a ball-room dancer for 8 years (until I was 22). And during that period of time she participated in various competitions. Now she is 28, a wife and a mother of 2 wonderful children - Nicole and Victor. Pole Dance has became her new passion. She has been doing it for 2 years and really loves this sport! She also likes to participate in competitions, to create bright stage images and costumes! Despite all her performing experience she feels nervous every time before going on stage. Hanna has been poledancing for almost three years. She didn't have any experience about dancing or performing when she started. Now she has been teaching poledance for two years at Pole4fit in Helsinki. She is also a part of poledance group called Pole Art Ensemble Vertiga. As a child Kristina trained 4 years in rhythmic gymnastics and 5 years in ballet school. While in college she also obtained a master degree in aerobics. She has been pole dancing for almost 2 years now. Last year Kristina also competed in Lioness category of Battle of the Pole competition and that was her first international pole dance experience. In August 2013 she won first place at the International Pole Sport Championship held in Saint-Petersburg and later she finished in 5th place in Miss Pole Dance Russia 2013 National Championship. Pole Dance for her is a form of art and a way of self-expression, a story told through moves and artistry. Sanna has no back round in dance. Sanna started Pole dancing tree years ago. Swedish Pole instructor and co-owner of Pole poison. She really likes to perform on stage. She is always looking for original dance and image, for good balance in choreography, tricks, artistry. Pole dance is her passion. Anastasia started Pole dancing 3,5 years ago. As many pole performers she also says -it has definitely changed my life! She didn't do ballet or gymnastics when she was younger, instead she was a sprinter when she was at school. Her favourite thing about Pole Dance is that it forces her to improve herself every day in every possible way. She loves to perform and create different characters and share them with the audience. 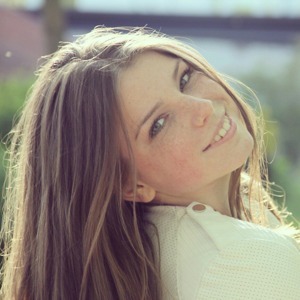 For the past 7 years she has lived in Prague,Czech Repbulic but she is originaly from Russia, Siberia – Tomsk. Vecislavs story with pole dance started when his yoga teacher offered him to try a pole dance class. This experiment turned into an exciting journey that brought him to victory of Swedish national championships 2013 in less than one year. Having a dancing background Vecislavs finds pole dance a new dimension of the dance art. Dancing was always an important part of his life and he was doing that for more than 10 years in a dance company back home in Latvia. After he moved to Sweden Vecislavs joined another company called “Opera Light” as a dancer and at the moment he is doing his third production with this company. Vecislavs sees pole dance as an opportunity to develop his dancing skills and he is looking forward for new challenges. Maryana started Pole dancing three years ago and it is now her primary occupation. She loves dancing and performing and is looking forward to compete in Battle 2014. Sara found Pole four years ago and instantly fell in love with the demanding and artistic sides. She has been dancing her whole life from jazz to hip hop, and her goal is to create clean and effortless-looking dance on pole. She is a pole dance instructor and entrepreneur, and loves the possibilities pole dance gives to people to overcome their fears, progress and get inspired. Battle of the Pole is Saras 4th competition, and she wants to keep competing until she reach her goals. Pink Puma inhabits in a brutal environment of sport and show business industry for 20 years. Since she was a child her qualities like hard work, patience, stamina helped her move forward and succeed. At the age of 17th this girl gained a title of Master of Sports in International Level. By this time her work experience includes many well-known entertainment corporations and sport organizations. Her performance background consists of enormous quantity of sport, dance, martial art and circus disciplines.